One of the more positive consequences of the screenwriters' strike and resulting TV hiatus is that Saturday Night Live's Fred Armisen will be performing at Stateside on Tuesday. Since he began on SNL a few years back, he's proved that a genuinely creative approach to comedy pays off. Proof: The Weekend Update bit he does with Kenan Thompson in which Fred plays a deaf comedian and Kenan plays his translator, who quickly becomes irritated with the apparently racist nature of his otherwise unintelligible jokes. When we got word of Fred's appearance in Santa Barbara, I jumped at the chance to talk to him. Be happy about Fred Armisen. Not just that he exists, but that he will soon be performing in Santa Barbara, a city not exactly known for drawing a lot of high-profile comedy acts. While the screenwriters’ strike may have interrupted his fifth season on late-night mainstay Saturday Night Live, it has also offered the New York-born comic and musician a chance to diversify his act. Regular SNL watchers have no doubt seen Armisen deftly impersonate the likes of Mahmoud Ahmadinejad or Law & Order’s Sam Waterston. They should also now that Armisen generally likes some music in with his comedy. (Or is that comedy with his music?) His unplanned time off has given him a chance to branch out with ThunderAnt, an online comedy project with former Sleater-Kinney rocker Carrie Brownstein—a fact by itself makes him cool enough to demand your attention to excite your about his upcoming appearance in town. Armisen was kind enough to speak with the Independent. Can you talk about what your stand-up act is going to be like, especially for the people who are more familiar with you from SNL? It’s going to be some drumming—like me playing some drums and doing some impressions of drummers and doing some character named Jenn Hannaman, who is like this guy who is a drum instructor who did a DVD on drum instruction called Complicated Drumming Techniques. It’s a little bit of that, some talking and some other impressions. It’s laid-back. It’s an evening of talking about music and things like that. Yes, there will be a little bit, definitely. I try to incorporate that into the show. It’s a mixture of that and the talking. And also, it’s not all planned out so much. That’s the most important thing, because who knows what will happen. I feel like, maybe now more than in previous seasons, SNL has a lot of very musical castmembers. Could you talk about different castmembers’ musical takes and what it’s like to work with them? As far as the current cast goes, we’re very musical. The one person who seems most musical, in a way, is Maya Rudolph, who comes from a musical background and sings really well and is a musician. We definitely found a kinship when I got to the show. Amy Poehler is also really musical. She’s a really good singer, and I don’t think she does that much of it on the show. She’s also a really big music fan. She’s connected to a lot of bands. Andy Samberg obviously has his own musical career, in a way, and his success on the show has come in large part to songs. He’s a brilliant lyricist. And Jorma Taconne, a writer on the show, writes a lot of the music pieces in the digital shorts. That’s a musical duo right there. Kenan [Thompson] is great. He has a musical style. Will Forte is really funny musically and plays some guitar. Jason Sudeikis is actually a good singer and plays some guitar, but he secretly likes musicals, like, more than I ever expected. He knows them all, he knows who was in the original shows. It’s like, “Where was this guy hiding?” Seth [Meyers] is a big musical fan and has written some music for the show. Kristen [Wiig] is really funny at musical impressions. She can do so many different female singers. And she’s also a really good singer… Bill Hader is great at musical impressions as well, and he’s also friends with bands like The Flaming Lips and a bunch of bands. He’s in that scene. I think he’s also friends with The Arcade Fire. And Darrell Hammond was in a musical on Broadway this summer. So I’m not leaving him out. He’s also got a musical background. He’s actually probably been the most employed musically, since he’s done the Broadway shows. Is it unusual for that many people who are there for comedy reasons to also be so musically inclined? Or is that pretty standard for groups like the SNL cast? [SNL] is my only experience, really. It’s one of the first TV show jobs I’ve ever had. It seems normal to me but who knows what other casts are like. But I think a lot of comedians gravitate toward music anyway. Well, when I heard that you’d formed a duo with Carrie Brownstein, I just assumed it was a band, but it wasn’t until I went to the website that I found that ThunderAnt was actually more of a comedy duo. How did that come about? Carrie and I have been friends for a while. And before her band broke up, I would go visit her up in Portland and we’d always have a really good time. One time, I think I had to make a video tape for a Democratic fundraiser. And I asked her if she would help. And we ended up working really well together. She’s a good writer and a good performer. I just find her so funny. So we made this one thing and it made the rounds and people seemed to like it. Then we made more and more of them. Before we knew it, we had all this tape, and we were like “Why don’t we just call it something?” We put up the site for it and see where it goes. It’s something that makes me more happy than anything. I love doing it so much. Literally yesterday we did another one. I flew to Portland and we shot it. Sleater-Kinney, by the way, is my favorite band. So I was happy to become friends with them. But then this other thing just took off for us. Ands we’re not like “Oh, we’re the funniest people in the world.” We just like it and we just have to keep doing it. It’s funny to me because I feel like even people who are huge Sleater-Kinney fans might be surprised to find out that Carrie does comedy—and a pretty good job of it, maybe even better than people might expect from somebody who’s so good at doing something else. Where did “ThunderAnt” come from? The name? The state rock of Oregon is the thunderegg. And we had planned to use that name, but then we decided we should look online and see if there’s any other band called Thunder Egg. And sure enough, there was this band on the East Coast somewhere called Thunder Egg. And we were like, “Oh well. That’s that.” We still liked the “thunder” in there and felt that “thunder-something” would still sound good. Carrie came up with ThunderAnt. So it’s like an opposite, you know. That’s where that came from. As far as being on SNL, you guys are on hiatus at the moment as a result of the strike. Is that frustrating for you, especially in light of the fact that we’re going through presidential primaries and there’s a lot out there to be made fun of? In a way, it is frustrating. But at the same time, it’s really opened a lot for me mentally and performance-wise. It’s pushed me to do other things. It’s actually given me time to concentrate on ThunderAnt. It’s given me time to work on the drumming character I was telling you about. So there’s that. But it’s actually been frustrating most of all to not be able to hang out with my friends at work. As corny as it sounds, I love those guys. We have the best time ever. I miss them, I miss Lorne [Michaels], I miss the writers, I miss all of it. But this has still opened up a lot of stuff for me. Even live stuff. Going out and performing live is not something I do a lot, so it’s not like the Santa Barbara show is just some blip. I do very few shows. Even allowing me to do the Santa Barbara show is something that’s brand new to me. So it’s frustrating for me, but it’s a huge opportunity. So can you tell me how it came about that you did the episode of 30 Rock, on which you played the non-terrorist terrorist? Oh, that’s a combination of things. I’m pretty good friends with [former SNL cast member] Tina Fey and her husband Jeff. They live close by to me. Sometimes when I call them, I pretend to be somebody else. I think one time I called them and pretended to be someone from Hamas, some sort of terrorist. That’s just a joke we’ve had, where I call and pretend to be a terrorist guy. By the way, when I say that, I’m not saying that I thought of the idea [for the episode], but Tina knew that I could do the accent. Then they separately wrote the episode about having a neighbor who’s a terrorist. So that’s how that happened. I noticed you’ve also been keeping the SNL blog for NBC.com. It’s not been updated lately. Is that a result of the strike? It’s a cool feature. I like getting insight to what happens backstage at SNL. I remember you said once that Amy Poehler does impressions that you don’t see on the show — like Katherine Moennig from The L Word or Karen O from the Yeah Yeah Yeahs — that we don’t ever get to see on SNL. There’s a lot of that. There’s a lot of impressions that go on that don’t necessarily get on the show because we don’t know how it would work. But it happens all the time. It’s great. There’s this other show going on, with Amy Poehler doing impressions and Bill Hader doing his impressions. It’s pretty great. I thought a nice way to end the interview and return to your background as a musician would be to ask you what you’re listening to nowadays. I feel like you have good taste and I’d imagine people might be interested in what you’ve been playing. Well thank you. I take that as a compliment. Petra Hayden is someone who’s been working on some new stuff that I’ve been enjoying. There’s a group called Rogue Wave who have a good song out called “Lake Michigan.” Azita Youssefi is another good one. There’s a whole bunch of stuff. I don’t want to cheat by going to my iPod and looking thought it. Well, I wouldn’t want you to cheat. I hope you can get back to work soon. Thanks for talking with me. I hope your show here in Santa Barbara goes well. 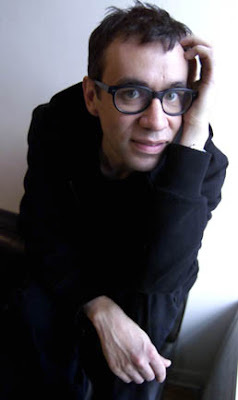 411: Fred Armisen will be performing at Stateside on Tuesday, January 29, at 8 p.m. Tickets are $13. And when I say "I'm really looking forward to it," I of course mean that I'm looking forward to the idea of it, since Tuesday is news deadline day and I'll probably be working until late. Bonus, semi-SNL downer that I learned while researching Fred: This season is purportedly the last for both Amy Poehler and Maya Rudolph, the latter of whom only decided at the last minute to continue on the show this season. Post-strike, the cast will be joined by Casey Rose Wilson, to help make up for the upcoming lack of female performers.